Kozma is on the move! Charles Glass has produced yet another future champion in the form of Jason Kozma. 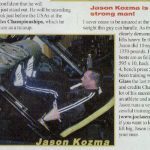 After an eight-year layoff from competitive body-building, Kozma enlisted the services of Glass as he prepared for battle at the 2003 California Champion-ships, where he scored a very impressive third place. Jason is a young man with a solid work ethic and the desire to be the best he can be. MMI: To get started, give us a little background on yourself. JK: tarn a personal trainer in Santa Monica, California. My business is quite successful — I have several trainers working under me. I’m originally from South Milwaukee, Wisconsin. “My first contest at age 16.1 took third place.” sports performance, and so we had a case of monkey see, monkey do. I always had to do what he was doing. He built a gym in our basement and created a workout for me. 44’e trained there together until a Gold’s Gym opened in town. I was too young to join, so I stayed at home. I also started martial arts at about the same time. I began with judo, went on to tae kwon do, and later to karate. My family moved to Nashville when I was 13. That was where I began my competitive bodybuilding career. I competed all the way through high school and also did some con-tests when I was in college. I took a hiatus from competition training for about eight years while suffering from crippling depression. I fought my way through that and started personal training. Then I began training intensively again, to get my physique where wanted it. In January of 2002 Charles (Glass) finally persuaded me to get back onstage after 12 years. I am in a committed relation-ship with my girlfriend, a bona fide angel walking on the Earth. L have many friends and a supportive family. Moving to LA has been a highlight of my life. I met my soul mate, created a successful business, and have been able to continue with my passion, bodybuilding. I trained with the late Don Ross several times. I know all the top guys at Gold’s, I train with Charles Glass, and I’ve met Arnold, Lou, Mike Christian and Joe Weider. For a bodybuilder I’m living the dream. Life is good. MMI: You had a very successful first season competing in the NPC. Did you expect to do so well at the Cal? JK: Well, it wasn’t my first season. It was my first season onstage in 12 years. 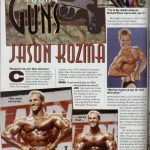 I used to compete as a teenager in NPC shows. Back then I won the Kentucky Derby, Tennessee Valley, and Southern States championships. I wasn’t really planning to compete again until I felt confident that I could win. I didn’t, though. I got third at the Orange County and Cal in the heavyweight class at a bodyweight of 204-206. I lost a little too much size on the diet. Next time I’ll be in the top of the heavyweight class at 224, or maybe in the superheavies. MMI: Standing backstage at the Cal, were you confident that the class was yours? JK: I did feel I was the most conditioned guy there, and I knew that would give me an edge over some of the bigger competitors. Besides, I was in the best shape I could be at that time. Considering I hadn’t gotten ripped for 12 years, I felt I had done all I could for that show. MMI: What was the atmosphere like backstage? JK: It was a little more tense than at the Orange County, but it wasn’t extremely tense. Generally, the guys who place high are pretty relaxed, as I and the other guys in the top three were. I spent most of that back-stage time kibitzing with Quentin Pullen and Tito Raymond. The tense guys usually are the ones who know they didn’t put enough into their prep. Once the time comes for your class to pump up, though, everyone gets quiet and focused. The people running the show were very helpful and friendly — not what I expected. Jon Lindsay runs a good production. MMI: Were you happy with the conditioning you took onstage? JK: I was as ripped as I possibly could have been at that time. My definition and symmetry are what got me into the top three. MMI: If you could turn back time, would you have made any changes in your preparation? learned from the experience, and I’ll be ready to drop the K-bomb in 2004. On the positive side, though, I had way more muscle than ever before, and at my leanest ever— 3 percent bodyfat. I also had striated glutes and a Christmas-tree lower back, which I was never able to get before. I feel that with the additional mass on my torso this year, I’ll be primed for victory. MMI: Working with Charles Glass, and as an accomplished trainer in your own right, do you have a better perspective than most people on why Charles is so successful? What separates him from the rest? JK: Charles has the ability to evaluate your physique, see what you need to work on, and find the best way to hit those areas, making you contract and feel the proper muscles. He’s not afraid to make you lift heavy weights, but he also knows when not to go for top weights, but concentrate on reps instead. There’s a reason why the top guys train with him — he gets improvement in even the most highly developed physiques. Just ask Gunter Schlierkamp, Mike Christian, Chris Cormier, Flex Wheeler, Paul Dillett, Melvin Anthony, Chris Cook, plus a whole bunch of other guys you’ve probably heard of. I train with him not only for my competitive goals, but also because each session is continuing education for my own personal-training practice. Of course, the biggest reason why he’s successful is that he loves what he does. He’s not a trainer because that’s all he can do. He’s a trainer because that’s what he wants to do. That’s the same for me. We often talk about client training techniques and the personal training business. MMI: Can you mention some of your best leg lifts? JK: I’ve done squats on the Smith machine of 675 x 3, leg presses of 1575 x 3, and hack squats of 900 x 5. MMI: What is your favorite leg workout? JK: Well, since training legs is like getting stabbed in the eye with a screwdriver, I’ll describe the one I dread the least: -Leg extensions (warmup) -Leg presses — 20, 15, 10, 5 reps •Front squats — 5-10 reps •Flacks — 5-10 reps •Vertical presses — 5-10 reps. This is an off-season routine. MMI: What is your training schedule? JK: I train on a six-day split, doing each bodypart once a week. Day 1 is hamstrings, day 2 chest, day 3 back, day 4 deltoids, day 5 quadriceps, and day 6 is arms. Day 7 is off. MMI: What supplements do you use in the off-season and precomp? JK: Off-season I take whey protein, creatine, glutamine peptide, multivitamins, minerals, ZMA, EFAs, 1-AD, tribulus and 6- OXO. Precompetition I add L-carnitine (Cuts 2), Guggul extract and ECA. I drop whey, 1- AD, 6-0X0 and creatine during the last four weeks. MMI: Does your weight training vary from off-season to precomp? JK: The only change I make precontest is that I go for higher reps — in the 10-to-15 range — and I use some supersetting. Also,1 train glutes for shows only. The split remains the same. MMI: What is your goal in training? JK: My present goal is to put on more quality size and compete this year as a superheavy or at the very top of the heavy-weights. I’m going to do the Cal, Junior Nationals and USA. I intend to carry on my brother’s legacy and get the pro card for both of us. Kozmania is runnin’ wild, baby! Aside from competitive goals my training is geared toward symmetry, proportion and strength. I pride myself in being strong on every exercise, not just a few. Not only have I benched 455 and leg pressed 1575 for reps. but I can also do laterals with the 75s, 25 chins or 3 with an additional 100 pounds. Flyes with the 100s, and curls with the 85s. MMI: Have you always been involved in sports? JK: Yes, I’ve always been active. MMI: What other sports have you practiced? JK: Besides martial arts (including a black belt in karate), I’ve done some baseball, football, basketball, archery and racquetball. MMI: What did your physique look like before you started training with weights? JK: I was a fat 12-year-old kid. I always wanted to look like a superhero, and now I do. MMI: Who was your bodybuilding hero in the early days? JK: Arnold. Duh. Also my brother, Joe. he got me started in weights, bodybuilding, competition and personal training. MMI: What is your academic back-ground? JK: I have a bachelor’s degree in business administration with a minor in finance. MMI: Do you have a personal motto? JK: What one man can do, another can do. That’s how I developed my near-superhuman strength. I would read what the pros were lifting and say to myself, “I can do that too!” and so I did. MMI: Have you any hobbies? JK: Computers, movies and reading. MMI: What are your goals in life? JK: I set short-term goals. My current goals include expanding my personal-training service to include other cities, employing additional trainers. Also I want to win my pro card within a couple of years. MMI: How did you train in the beginning? JK: I trained three times a week on a split routine. MMI: How has your training changed over the years? JK: I have found that my body responds to medium-volume, high-intensity training, focusing on one bodypart per day. When I started, I did the whole body three times a week. Then 1 changed to a four-day split and trained six days a week. I later moved to a five-day split and made better progress. Finally I decided on my current six-day split. My muscle volume is large enough to with-stand an hour on a single bodypart. Precontest I train six or seven days a week. The seventh day is only cardio. MMI: What’s your training philosophy? JK: I believe truly huge size and hardness can be achieved only through high-intensity and medium-volume training — at my level, that is. Look at the pros. Those who train hard have greater density than the pumpers. Beginning to intermediate trainees respond best to high-intensity, low-volume training (Mentzer style). MMI: How many exercises, sets and reps do you do per muscle group? JK: I do four to six exercises, usually closer to four, 4 sets of 4 to 10 reps for upper body (mostly), 10 to 20 reps for abs and quads, 10 reps for hams, and 16 reps for calves. MMI: Please give an example. JK: For back I might do dumbell rows 4 x 10, 10, 8, 5; chins 4 x 25, 15, 10, 10; hammer rows 4 x 10; close-grip pulldowns 4 x 10; straight-arm pulldowns 4 x 10; shrugs 4 x 10-15; dead-lifts 4 x 10. Shrugs and deadlifts work the traps and lower back, not the lats and midback, so I don’t really consider them back exercises. MMI: Which are your favorite and least favorite bodyparts to train and why? JK: My favorite is deltoids. Mine are hideously strong, and I like the way I look when I train them. Also, I have no shoulder injuries. My least favorite is quads. I hate doing them. My knees are always an issue, but I push myself hardest on quads. MMI: Prioritize the importance of diet, supplements and training. JK: Diet 80 percent, training 15 percent, supplements 5 per-cent, sleep 100 percent. MMI: What is your off-season diet like? JK: I eat six or seven meals per day consisting of three or four complex carbs, two or three veggies, but no fruit. I use a lot of bars and drinks in the off-season. MMI: How does your precontest diet differ? JK: Six or seven meals with two or three complex carbs per day, three or four veggies, no fruit. MMI: How important is bodybuilding in your life? JK: I have lived the bodybuilding lifestyle since I was 16 years old. I became a personal trainer out of my love for training. I’m a great trainer because of my bodybuilding background. Bodybuilding is probably the central point of my life. MMI: What do you dislike about the sport? JK: I personally think the bodybuilders are getting too big. 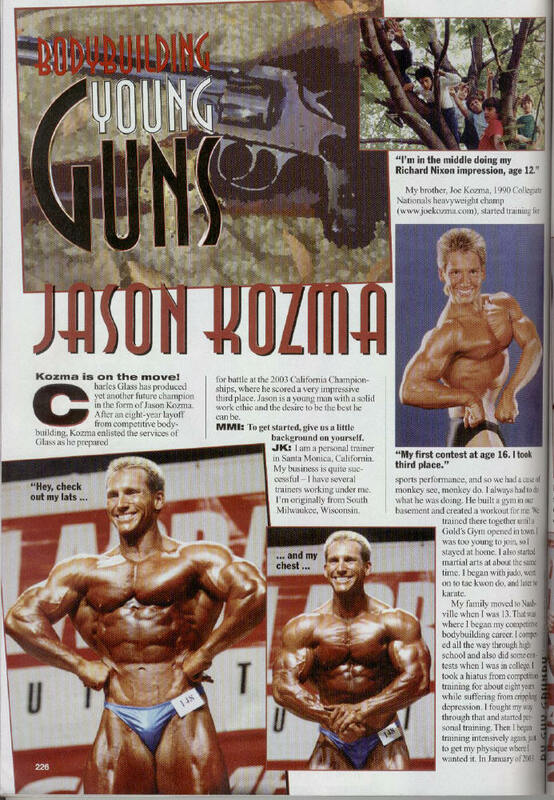 Competition is harder for me now, whereas 12 years ago I probably could have won a pro qualifier with my current physique. Now I’ll have to put on another 20 or so pounds. If those other guys weren’t so damn big, I wouldn’t have to work so hard! I also think bodybuilders still don’t make enough money. Otherwise, the sport gets better every day. By the way, I think figure contestants should have some sort of free routine. All they do right now is just stand there. MMI: Anything you would like to see published about you? JK: I would love to have a plug for my Web sites: www.jasonkozma.com and www.latrainer.com. Mention that I offer online personal-training programs. Also please plug my nutritional supplement Web site at www.kozmuscle.com for discount top-name products. 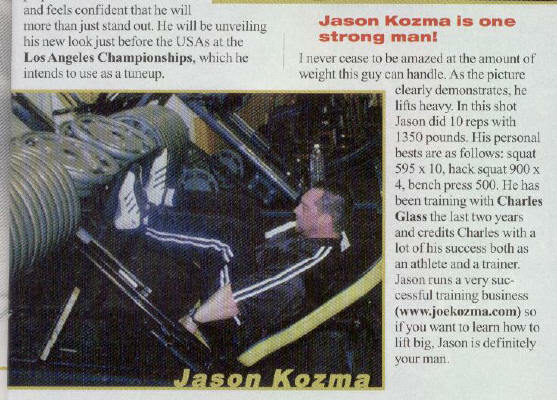 Jason Kozma is one strong man! I never cease to be amazed at the amount of weight this guy can handle. As the picture clearly demonstrates, he lifts heavy. In this shot Jason did 10 reps with 1350 pounds. His personal bests are as follows: squat 595 x 10, hack squat 900 x 4, bench press 500. He has been training with Charles Glass the last two years and credits Charles with a lot of his success both as an athlete and a trainer. Jason runs a very successful training business (www.jasonkozma.com) so if you want to learn how to lift big, Jason is definitely your man.